Hi dudes, We have already discussed many methods to Hack Facebook like Hack Facebook By Phishing Attack,Tab nabbing And many More. 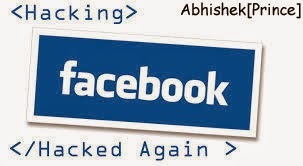 Today We are back with new hack for Facebook Account Hack by Android Mobile. This tute is very easy and you all will get almost 95% success if you and your victim are on same network. This tute is fully based on Android devices so you don't need to worry you don't need to have a PC or laptop for this simple hack Also Check Increase Ram of android by SD card. I am writing this tutorial to make you dudes aware so please make sure that you are not using this tute for any illegal purpose. There is an app here Called "Faceniff". FACENIFF is basically an Android app that lets users to sniff and intercept web sessions profiles over WIfi networks, stealing other users' credentials through which you all can attack your victim's or friend's Facebook, Twitter,orkut,gmail and much more accounts in a minute. Connect to any of the working network connections and open downloaded FaceNiff application. Press enter button and It will show you a list of all the accounts which are connected to that network and you can easily hi jack into that all accounts. The fix for all dudes is to enable HTTPS for every service where it is available. You can easily protect your internet connection when you use public Wi-Fi at a airport or coffee shop with a VPN, either to your school or office or a free service like Hotspot Shield. Alternatively, you can just not connected to publically available wireless networks and tether to your device or use your wireless carrier’s connectivity options instead.